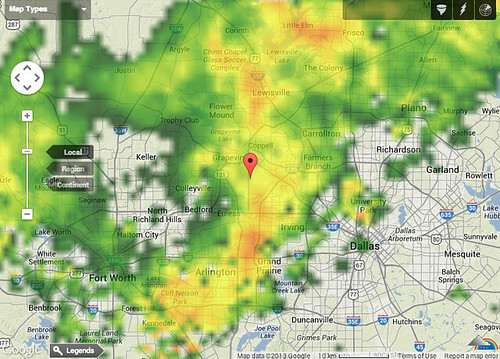 Were you affected by the crazy weather last night at DFW Airport? Yesterday evening, an arctic front moved into the North Texas area causing a rapid 20 degree drop in temperatures and setting off sever storms with winds gusting up to 35 and 40 mph. I’ve been out of town all week and was on an American Airlines flight back to Dallas last night. We were scheduled to arrive in Dallas around 8:45 PM, but about an hour before we were supposed to land the Captain advised us that there was a cold front moving into the region and that because of storms air traffic control had closed the airpot. We spent some time flying around Arkansas and Oklahoma trying to wait out the storms, but after about an hour we diverted to Oklahoma City for fuel. I have to admit that I sort of hoped that we’d end up spending the might in OKC. One of my very best friends lives in OKC and we were texting plans to (possibly) meet at Waffle Champion for breakfast (there’s no better way to start the day than with a Chicken Waffle Wrap for breakfast!). Sadly, it wasn’t meant to be: we spent an hour or so in Oklahoma City, refueled, and eventually got to Dallas around midnight (a few lucky customers who live in Oklahoma got to deplane in OKC). Through it all Captain Williams and the crew were phenomenal! So, how about you…did you get diverted? Got diverted. First they rerouted me to out the next day (which was out of the question). I was travelling DEN-DFW-EWR. I called the Plat line and then they put me leaving DEN at 7pm to LAX and catching the redeye to JFK, and they told me it was the best thing they could do. I immediately went online and saw the DEN-LAX noon flight available, and had to call back so they can rebook me on that and then catch the 3 PM LAX-JFK (in a 767-200). It was a long day! I was on the last AA2458 (ABQ-DFW) scheduled to land at 1930 and was watching our flight track on my phone when I saw the turn south. Captain came on the PA several minutes later to announce that were diverting to SAT. Spent 4 hours on the ground before we eventually left SAT for DFW with an ultimate arrival of 0030ish the following day!